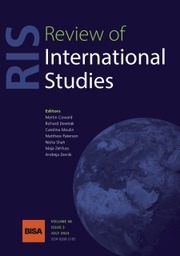 Review of International Studies is committed to the publication of high quality articles and the examination of a broad set of research questions. The Review seeks to reach beyond the traditional grounding of the discipline so that it reflects the changing nature of global politics, new political challenges and contemporary understandings. The Review aims to be a place where meaningful discussion of pressing global issues can take place, and where the voices in that debate are drawn from a truly international community. The Review publishes work that is theoretically informed, empirically rich, and methodologically rigorous, but which also pushes the boundaries of the discipline through theoretical, conceptual and methodological innovation. The Review strives to be the place where a range of perspectives can flourish and where truly outstanding work in the discipline is showcased and debated. The Review is a British International Studies Association journal.